A new space observatory that aims to investigate the edge ofthe solar system is poised to launch Sunday. NASA's $169 million InterstellarBoundary Explorer (IBEX) spacecraft is designed to measure particles bouncingback from the nether regions of the solar system, where the hot wind from thesun slams against the cold wall of interstellar space. The coffee table-sized observatoryis setto launch Oct. 19 at 1:48 p.m. EDT (1748 GMT) aboard a Pegasus XL rocket fromthe Kwajalein Atoll, a part of the Marshall Islands in the Pacific Ocean. "IBEX is really a mission of discovery," said NathanSchwadron, IBEX co-investigator and chief of the spacecraft?s science operationscenter lead at Boston University, in a Friday teleconference. "We reallyhave never seen the structures that surround and protect our entire solarsystem. We know very little about what we're going to see." The sun unleashes aprotective bubble of charged particles around the solar system called theheliosphere, which shields the planets from deadly cosmic rays. Over the past15 years, the pressure from this solar wind has been diminishing, and is now atthe lowest level measured since the beginning of the space age, said DaveMcComas, IBEX principal investigator at the Southwest Research Institute in SanAntonio, Tex. "We don?t know whether we're on the verge of a largerreduction or whether we're near the bottom," McComas said. "What'smost likely is that there are natural variations in this solar wind pressureand that over time it will either stabilize or start going back up, but nobodyreally knows. So it's an interesting time to live in." The scientists hope the newspacecraft will shed new light on this decline, as well as how changes inthe heliosphere may affect Earth. 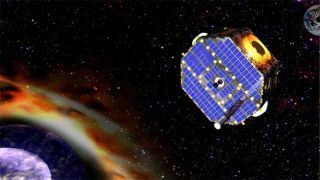 To study the dynamic interactions taking place between theheliosphere and the rest of the galaxy, IBEX is outfitted with two bucket-sizedsensors that will capture neutral hydrogen atoms travelling back toward Earthfrom the edges of the solar system. Luckily, to study the distant edge of the solar system, IBEXdoesn't have to travel nearly that far. The spacecraft will rocket to an orbit200,000 miles (322,000 km) above the Earth, high enough to escape contaminationfrom our planet's magnetic field. The moon, for comparison, orbits about240,000 miles (385,000 km) from Earth. "Every six months we will make global sky maps of wherethese atoms come from and how fast they are traveling," said Herb Funstenof Los Alamos National Lab, which built IBEX's High Energy Neutral Atom Imager. "From this information, we will be able to discover what the edge of ourbubble looks like and learn about the properties of the interstellar cloud thatlies beyond the bubble."